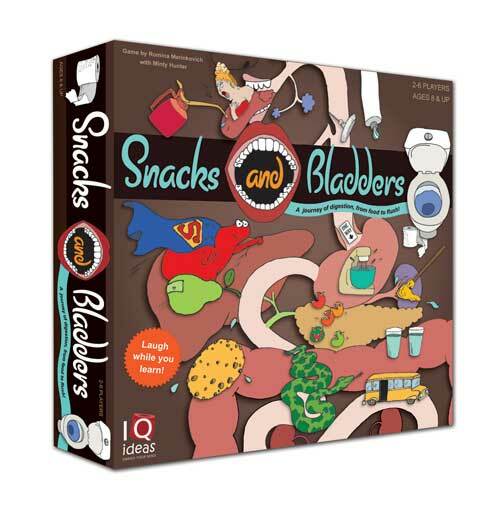 Snacks and Bladders is a wonderful exploration of the human body and the food we eat to fuel it. 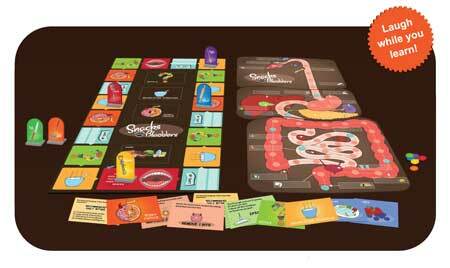 Correctly identify body parts and make wise food choices to stay ahead of your opponents as you travel through the digestive system. 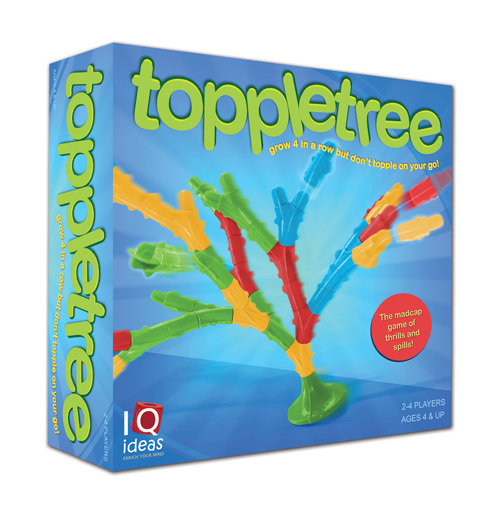 An entertaining way to learn about this fascinating subject. This one has all the stuff in it that kids love- poos, wees and vomit! Seriously, it’s a fabulous romp through digestion and food, and another great collaboration with Romina Marinkovich of Moa Hunt fame. We were involved in the early play-testing and made various suggestions which I think really helped in terms of game flow. Originally it was a single board before I suggested that two boards would really allow Bek and Romina’s fantastic illustration of the digestive system room to breathe (ahem). The body board ended up as 3 jigsaw pieces in lovely thick card, and the track is a separate board. The production values on this one really shine! Aside from the board, Bek added lots of other beautiful graphic touches- the playing pieces as kitchen utensils are delightful. I’d also worked hard to keep the heart of the game while reigning in some of the more complex original rules. Often good game design is about distilling something to its essence, and making it work logically- this is known as ‘removing chrome’. I was especially pleased with the final implementation of the food cards- the game-play mechanic reflects what sort of food you should have and in what quantities. All that effort lead to a co-designer credit, which I’m quite excited about! If you’ve got any questions about the game drop us a line or leave a comment below- we love feedback! This one has all the stuff in it that kids love- poos, wees and vomit! Seriously, it’s a fabulous romp through digestion and food, and another great collaboration with Romina Marinkovich of Moa Hunt fame. We were involved in the early play-testing and made various suggestions which I think really helped in terms of game flow. Originally it was a single board before I suggested that two boards would really allow Bek and Romina’s fantastic illustration of the digestive system room to breathe (ahem). The body board ended up as 3 jigsaw pieces in lovely thick card, and the track is a separate board. The production values on this one really shine!